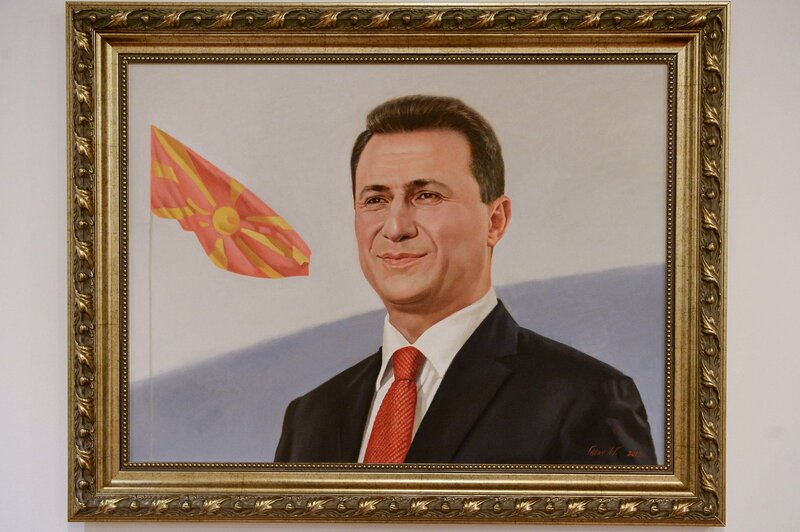 While in power, Nikola Gruevski’s cabinet commissioned this portrait of himself which still hangs in the seat of Government of the Republic of Macedonia, alongside somewhat smaller paintings of other former prime ministers. PHOTO: Public domain. Evading a two-year prison sentence for corruption, Nikola Gruevski, the former prime minister of Macedonia, has sought refuge in Hungary. Gruevski went missing on Thursday 8 November, when the six bodyguards he had hand-picked from the Ministry of Interior allegedly last had contact with him. Gruevski had been involved in protracted legal procedures to delay serving a two-year prison sentence in a case code-named Tank that charged him with abuse of office. His lawyers filed numerous appeals after the Supreme Court confirmed his verdict in October. Gruevski was supposed to have reported to prison by Monday 12 November. On Tuesday 12 November, however, he announced on Facebook that he had relocated to Budapest as he had been receiving threats. He has applied for political asylum in Hungary. The escape has caused an uproar in Macedonia and the region, as the public demands answers about how and why the former strongman managed to pull it off. While Gruevski’s escape was unprecedented in Macedonian history, his choice of destination wasn’t too surprising. Over a year ago, Global Voices reported that Gruevski may have made a deal with Hungary’s prime minister Viktor Orban for Hungary to provide refuge for fugitives connected to abuses of power by Gruevski’s regime. Gruevski and Orban have a history of cooperation. Hungarian banks have been involved in corrupt deals for siphoning Macedonian taxpayers’ money. The two leaders exploited the 2015 refugee crisis to create xenophobic hysteria for joint political gains, waged coordinated campaigns against civil society, and engaged in financial machinations related to funding party propaganda. At European Union level, the two leaders’ populist parties, VMRO-DPMNE and Fidesz, have a history of using their membership in the European People’s Party (EPP), a pan-European association of right-wing political parties, to minimize or delay international community response to abuses within their countries. These escapes to Hungary have been enabled by the Macedonian judiciary, which decided against detaining suspects in many ongoing corruption cases. Over the last several years, European Union reports have indicated that Gruevski’s party had been undermining the independence of the courts by filling them with regime loyalists. In a country which has been steeped in conspiracy theories for decades, many have wondered if the current government had made some sort of deal to let Gruevski go, in exchange for his party’s support in parliament on name issue agreement with Greece, a matter that has been the subject of media speculation for several months. Fokus weekly cover from 23. August 2018. They did and he did! On Wednesday 14 November, however, Macedonian prime minister Zoran Zaev vehemently denied the allegations of a political deal with Gruevski. Other citizens, including legal and human rights experts, have demanded that the government assume responsibility for the embarrassing scandal, and have expressed disappointment with the government they had voted into power on the promise of a return to the rule of law. МВР чека види каде е Груевски. Министерство за надворешни работи чека МВР да потврди дека Груевски е надвор од МК. Судот чека барање од ЈО за притвор на обвинетите со Груевски. СЈО чека информација од МВР дека Груевски е избеган. ПА ИМА ЛИ НЕКОЈ ШТО НЕ ЧЕКА НЕШТО ВО ДРЖАВАВА? Ministry of Interior (MOI) waits to see where Gruevski is. Ministry of Foreign Affairs waits for MOI to confirm Gruevski is outside of Macedonia. The Court waits for request by Public Prosecutor to issue detention warrant for Gruevski’s suspected accomplices. Speacial Prosecutors Office wait for information from MOI about Gruevski’s escape. IS THERE ANYONE IN THIS COUNTRY WHO DOESN’T WAIT FOR SOMETHING? Several leading civil society organizations strongly condemned the “omissions, gross negligence and disrespect of provisions contained in the Law on Execution of Sanctions and the Rulebook on Performance of Police Work, on the part of the Basic Court Skopje 1 and the Ministry of Interior” that resulted in the escape of the convicted felon. A number of issues related to the case remain unclear. Considering the close ties of both Gruevski and Orban with Serbian President Aleksandar Vucic, whose SPS party is also an EPP member, many supposed that Gruevski had passed through Serbia. Many have speculated on the ironic possibility that he might have used the Balkan Route taken by refugees he derided in the past. The latest official information indicates that Gruevski escaped via Albania, passing through Montenegro, with help from the Hungarian authorities, but details of his full itinerary are still unknown to the public. Gruevski left AL 11-NOV 19:01 crossing to ME via Hani Hotit with diplomatic car CD1013A owned by Hungarian Embassy in Tirana. At the moment, Gruevski’s request for asylum is being handled by Hungarian authorities. Another point of irony is the fact that in recent years, the Hungarian ruling party has changed the laws in order to make it harder for asylum seekers to remain in the country. Macedonia is considered a safe country of origin under Hungarian law. Hence an asylum application will not be considered on its merits unless claimant can show country of origin is unsafe for him. A professor at Central European University, which has been forced to phase out its operations in Budapest because of pressure from Orban’s regime, decided to make the most of Gruevski presence in town and issued an open invitation for him to take part in a public event. Macedonian authorities have announced they will file an extradition request.